ART POP-UP GALLERY IN CARP! ARE YOU INTERESTED? I hope I got your attention! Artists of the West Carleton Arts Society have been given the opportunity to set up a ‘pop-up art gallery’ at The Village Station in Carp from May 1 to July 31. 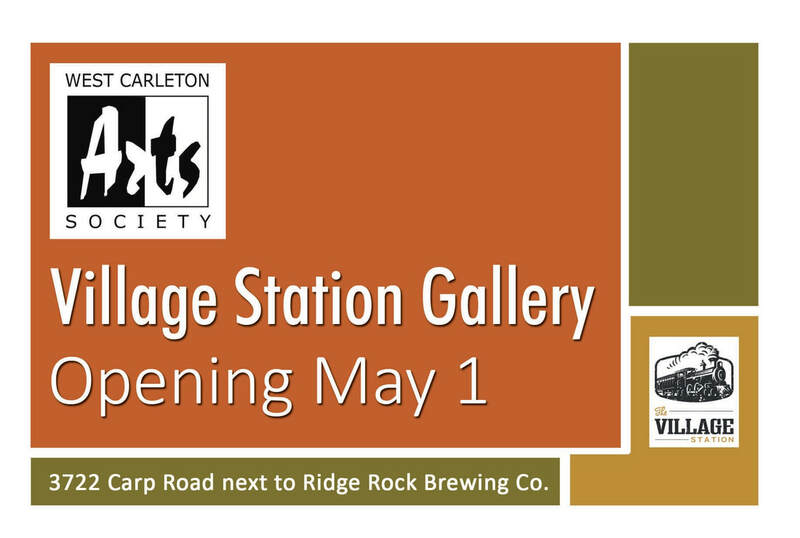 The Village Station is a house located between the Ridge Rock Brewery and the Vet on Carp Road. It is currently occupied by Autumn’s Fine Flowers (kitchen/eating area), another business selling cosmetics and pot accessories (front study), as well as several offices on the second floor. Art works, would be hung in the current Living Room/Dining Room area, hallways, stairwell, and possibly one of the upper level offices/bedrooms. We will be hanging with nails. Lighting is minimal. 3-D items are accepted. Tentative plans could include a Vernissage, a grand opening for The Village Station (involving our participation), featured artists, art demonstrations, promotions in the newspapers and the Carp brochure, etc. AND the most exciting part is participation in a possible future permanent art gallery in Carp, if and when that location becomes available. It is important that you read through the details carefully. PLEASE NOTE: This is not a free space and you would be required to help cover costs for usage of the space, staff and cash system. Please send your application with payment by midnight, Tuesday, March 26, by clicking on the link at the bottom of this page. Commitment: May 1 to July 30 inclusive. Artists will be expected to replace any items that have been sold with another suitable piece until the end of the show. If they cannot, another artist will be offered the spot. - Artwork may be sold directly by Autumn’s Fine Flowers on behalf of the WCAS. 5% commission will be payable to Autumn’s Fine Flowers at the time of the sale that results from a viewing during the time your piece is hung at the facility. This fee will cover the costs incurred from using their cash system, personnel and wrapping materials to process sales. Artists will be paid by Autumn’s Fine Flowers on a weekly basis for any sales that take place. PLUS 5% commission paid to WCAS, on any sales that result from a viewing during the show, up to and including 60 days after the show. Volunteer Participation: All artists will be called upon to assist to help us make this the best pop-up ever. Each artist is asked to help promote our event by distributing promotional materials and sharing event news on social media. On your application you will be asked to check at least two of the tasked listed below indicating where you think you are best suited. Works of Art: All pieces must be ‘exhibition ready’. A Selections Committee will review all applications. The choice of the committee is final. Application must include the images you intend to show. (Less than 1mb each, 300 dpi) Unless otherwise indicated, photos may be used for social media and other promotions. Images should be titled as follows: Your Name_01 Title_medium_size.jpg. NOTE: No cards, matted prints, or small gift items will be accepted at this time, as the florist currently carries these items. If you are submitting 3-D items you may be asked to provide a small table to display your items. Insurance/Security: The space coexists with other businesses. Personnel will be on hand during business hours to monitor traffic and sales. Each artist is responsible for their own insurance or hang at their own risk. The Village Station will not be held responsible for damage or theft of any art pieces. Artists must be aware of the risk or carry his/her own insurance for loss/damage. WCAS Membership: Membership in the West Carleton Arts Society is mandatory. Please see the WCAS membership page for details on membership benefits. Please contact Ginny Fobert at ginnyfobert@gmail.com if you have any questions. Supporting Ottawa artists for 31 years.